Alfred Magee Jr returns to the light carrier USS Cowpens (CVL 25) unaware that he has a catastrophic fuel leak on 24th November, 1943 during the Gilberts raids. 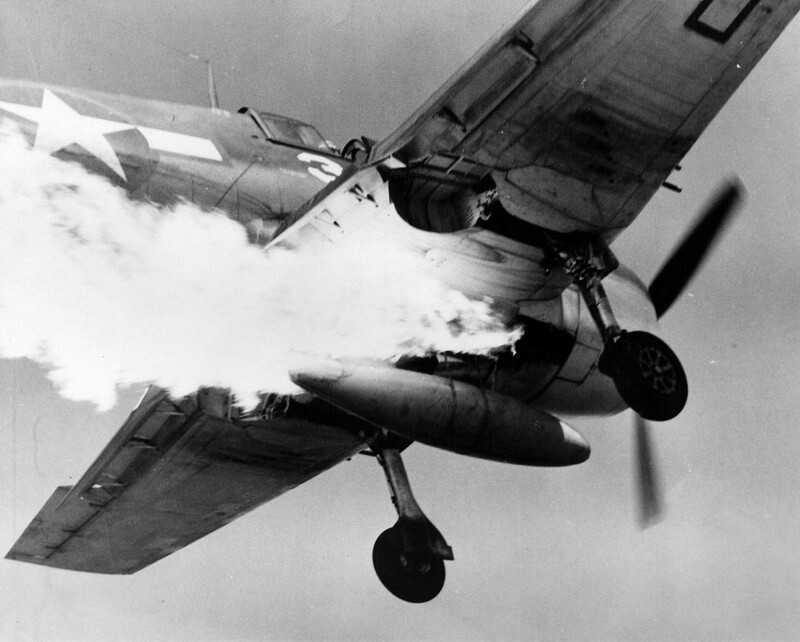 Despite taking hits in his Hellcat and being on fire, Magee landed the aircraft safely and there were no casualties. 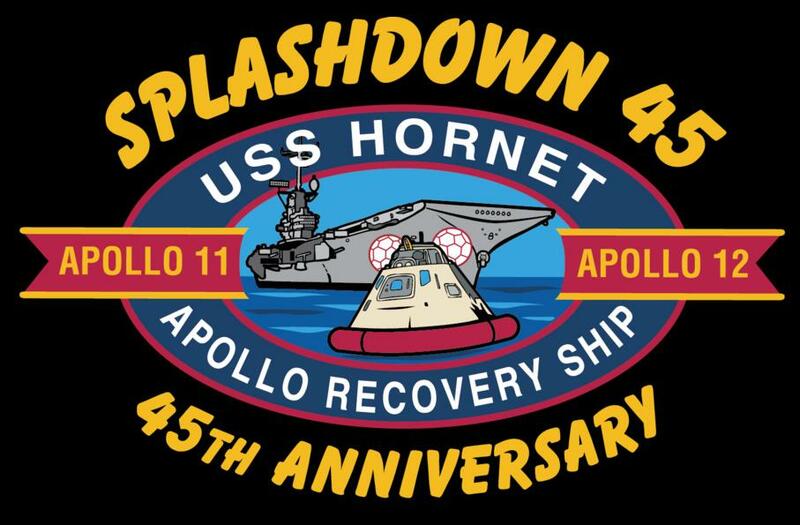 It was today in 1971 that ‘D.B. Cooper’ hijacked a Boeing 727 and extorted $200,000 (today’s equivalent is about a million and a half dollars) before parachuting somewhere between Portland (Oregon) and Seattle (Washington). Despite a massive manhunt, Cooper was never found and remains to this day the world’s only unsolved case of air piracy. This is the Apollo 12 capsule being recovered by USS Hornet crew after returning from the moon on November 24th, 1969. 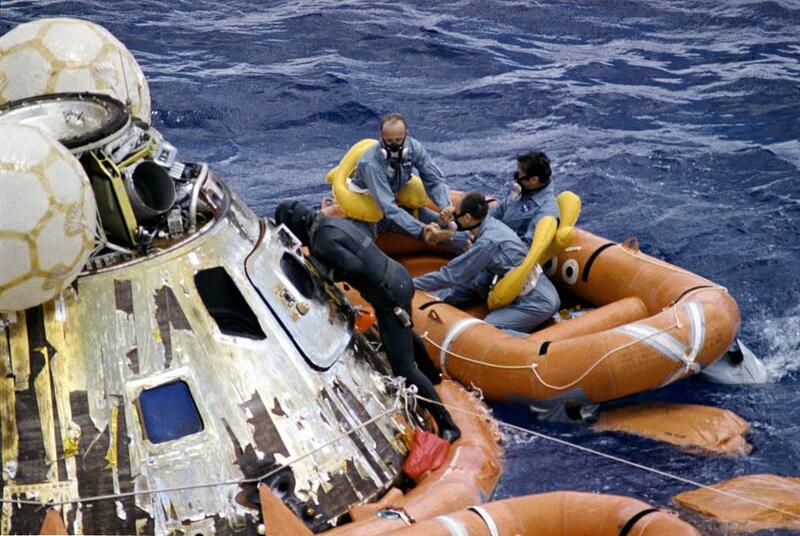 In the raft are the three astronauts, Pete Conrad, Richard F. Gordon Jr., and Alan Bean. On 24th November, 1944, one hundred and eleven B-29’s bombed Tokyo, the first attack on the Japanese mainland since the Doolittle raid. Below is the lead Superfortress, ‘Dauntless Dottie’ accompanied by its pilot Major Robert Morgan, better known as the captain of the ‘Memphis Belle’ for the majority of her sorties. The photo below is a personal favourite, the crew of ‘Waddy’s Wagon’ taken before preparations for the raid on Tokyo (above). The photo was taken in November 24th, 1944. 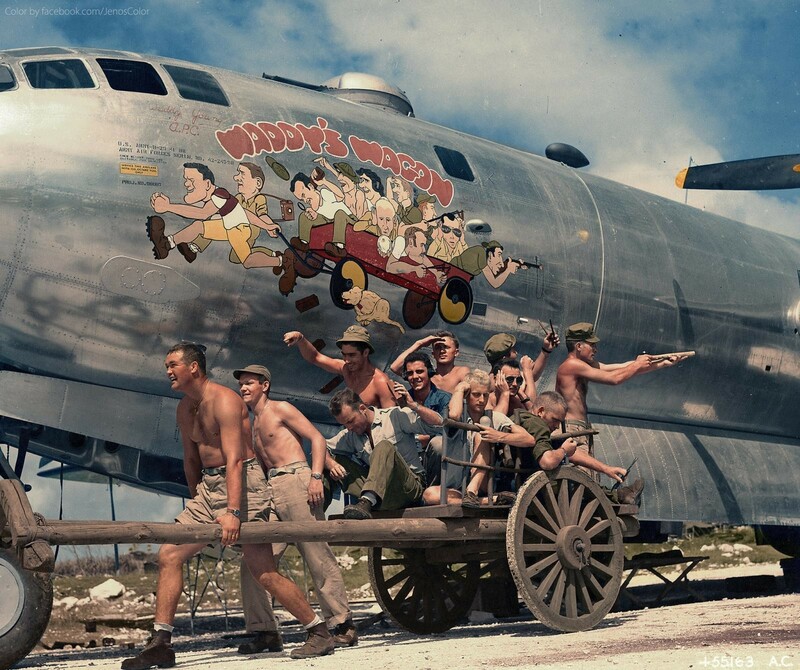 On January 9th, 1945 all these young men were killed when Waddy’s Wagon was shot down attempting to guide a crippled B-29 back to safety during a mission against the Nakajima aircraft factory in Japan. May they rest easy. F2H-2 Banshees from USS Coral Sea (CVA-43) flying in formation, November 24, 1950 above the Mediterranean. 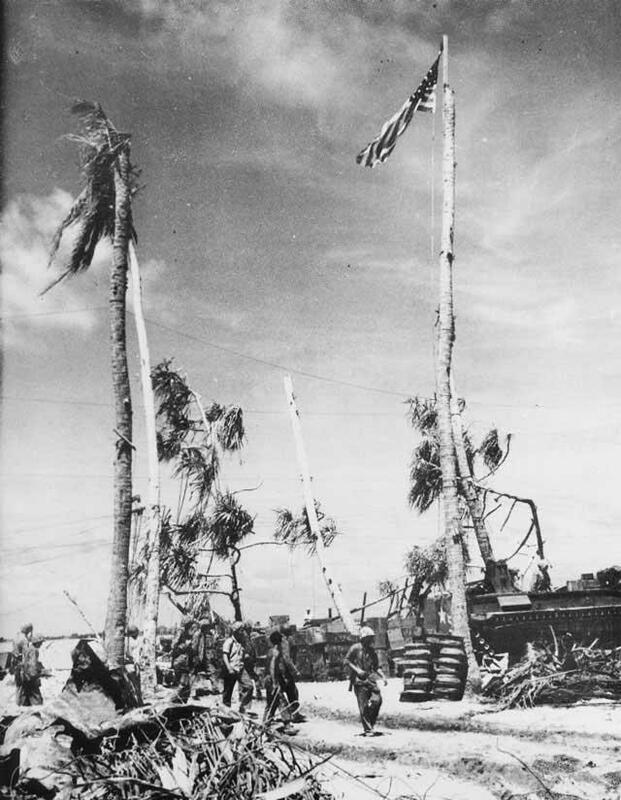 American flag raised in Tarawa atol. 14 responses to On This Day…November 24th. In fact quite a few modellers have produced this and similar vignettes using LEDs, often to a very convincing effect. ‘Waddy’s wagon’ is so bitterly touching. It’s a brilliant photo – a ‘decisive moment’, indeed. It’s quite something, Paul. Captures the youth, playfulness, creativity, and humanity of these ‘kids’ – and their fate just a few days later trying to save their stricken brothers tells all you need to know about their spirit and bravery. So sad about Waddy’s Wagon. I had seen the photo numerous times but I hadn’t heard of the later news. HOW did the F6-F land safely? (more or less.) It was from the original Iron Works, that’s how! The Cat from Hell! Tough as nails. That’s why most pilots loved theirs. Those were tough aircraft, Jeff. And tough men. Tough birds from Long island N.Y. Plane Commander, Captain Walter R. “Waddy” Young, Ponca City, Oklahoma. Lieutenant Jack H. Vetters, Corpus Christi, Texas, pilot. Lieutenant John F. Ellis, Moberly, Missouri. Bombardier; Lieutenant Paul R. Garrison, Lancaster, Pennsylvania. Navigator; Sergeant George E. Avon, Syracuse, New York. Radio operator; Lieutenant Bernard S. Black, Woodhaven, New York. Flight Engineer; Sergeant Kenneth M. Mansie of Randolph, Maine. Wilbur J. Chapman of Panhandle, Texas. Corbett L. Carnegie, Grindstone Island, New York. Joseph J. Gatto, Falconer, New York. I actually meant the aircraft from Grumman, but the info you related adds to the human story. No, I knew you meant the Grumman, Long Island works, Robert – but just wanted to show that a lot of the lads on that plane were from New York, also.